Nothing planned for the weekend yet? We have a hot tip for you: From the Porsche plant in Gmund in Austria to the family domicile in Zell am See – and back. We already went on this cruise – in a 356/1 Roadster. Why should you? Because it’s fun. Because it can do it. And because it simply makes sense to take exactly the same route with the Porsche 356/1 Roadster where Ferry Porsche teached it to drive: from the Porsche plant in Gmünd in Carinthia to the family domicile in Zell am See – and back. Going clockwise. Via the Grossglockner peak on the way there and the Katschberg Pass on the way home. Or the other way round. Actually, it doesn’t matter as long as the car’s allowed to apply the 35 hp of its four-cylinder engine to the streets as down-to-earth as it used to. This silver purist doesn’t ask for more. It just wants to drive. So it keeps rolling complacently, keeping off the worst of the wind with its tiny split windshield and letting the unsynchronized transmission click whenever it wants to. Because it’s allowed to do so. After all, it’s number 001. And then you get to prove your intuition. Until you think that no bend is too tight and no radius too small. Until it challenges you again, asking you to dance with these 585 kilos. And all of a sudden you’re reminded that it doesn’t drop anchor when you step on the brakes vigorously. Because it’s the first Porsche prototype bearing the name Porsche. Because it’s old, the predecessor of the 901. It became street-legal on 8 June 1948 with the license plate K45-286. Manufactured by Ferry Porsche and chief designer Karl Rabe and his team in time-consuming hand work. Made from Volkswagen components, obviously. Bearing the working title »VW-Sport« and with the Beetle engine right in front of the rear axle as is right and proper for a race car. Perfect grip at speeds of up to 84 mph. Perfectly made for dancing through corners in the midst of 3,000 m peaks popular among winter sports lovers and hiking fans. Made for dreaming. - A cap. Glasses. Chamois leather. - Awe, since a wonderful story had its start with exactly this no. 1 – and at Porsche it doesn’t collect dust in the museum. - Leather gloves, because the wafer-thin steering wheel has earned an embrace with dignity. What are the problems you might encounter? - The sad fact that there will never be a 356 again. The last of its kind left the plant in 1966. - Amateur photographers, know-it-alls and car body gropers at every stop. - Rain. But that’s what the cap on your head is for and there’s the emergency top too. Though rain cannot really be considered an emergency. What are the things you shouldn’t miss? - Stopover at the castle Prielau in Zell am See to taste the cuisine of starred chef Andreas Mayer. - Pausing briefly at the Aineck summit cross. - Quick side trip to the Krimml Waterfalls. For no special reason. Has nothing to do with Porsche. Other than that they are just as popular. What do you need to do without? - A steaming radiator. Simply because air cannot boil. - The sandbags, hopefully, when driving up the Katschberg Pass. Ferry Porsche needed them in March 1948 to simulate the car body weight on the naked chassis of the 356/1. - Doorknobs. Instead, pull the cord while pronouncing the word a-e-r-o-d-y-n-a- m-i-c-s clearly and loudly. 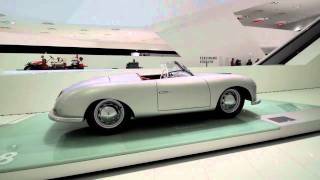 - A history lesson on wheels can only be accompanied by pure Porsche sounds. - The slight clicking sound of the unsynchronized transmission. Somewhere between a coupé and a convertible, the 911 Targa conquered new territory and created a legend. 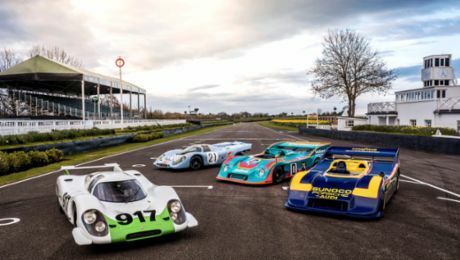 For the first time, Porsche has presented four driving examples of the 917 at 77th Goodwood Members' Meeting. 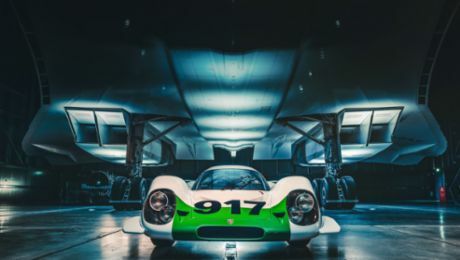 In marking a special anniversary, the Concorde 002 and the Porsche 917-001 have met in England.